« « Exploding Lithium Flashlight Batteries? The Kim family’s survival story and the tragedy of the loss of the father has captured the attention of the nation this past week. Even at the funeral for an old and dear friend, it crept into the conversation and I was asked questions about it. I take no joy in having correctly predicted the father’s demise, a true tragedy. No matter how heroic his effort to save his family, it didn’t have to end this way. Every tragedy like this is the result of multiple missed opportunities to prevent it from happening. Intercede at any point and tragedy is averted. Let’s examine those opportunities. The most fundamental missed opportunity was a lack of preparation for an unexpected emergency, which on any road trip includes being stranded. 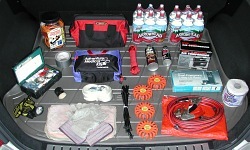 My normal everyday preparedness/survival kit that I carry in our car is pictured here (click for larger image). It all fits into a modest-sized duffel bag. It includes tools, supplies to improvise mechanical repairs, shelter, first aid, water, distress signaling and warning gear and other auto emergency essentials that I am never without, even in the urban environment in which I normally travel. Since the weather is almost always mild or warm here in the desert southwest where I reside, there’s no cold-weather specific gear in my everyday car carry like there would be if I lived elsewhere. And, yes, that’s an “old fashioned” CB radio. It still works in situations where a cell phone may not. Speaking of cell phones, I always carry a back-up AA-cell charger for my cell phone like the Charge 2 Go in my EDC kit and the crank-powered IST Sidewinder in my travel kit. And remember, altitude is your friend when you are having trouble getting cell phone reception. We’ve had situations way out in the wilderness where we had no bars in a valley, but climbing up a hundred feet to the top of a hill resulting in plenty of bars. Also, if you have difficulty getting through with a voice call, sometimes text messaging will work fine. For a road trip outside my urban home environment, I throw in my Aviation Survival Kit and carry my personal survival gear including my 406 MHz personal locator beacon (PLB). If I’m heading into snow country, I also throw in some cold-weather sleeping bags. We also always have a cooler with food and drink on the road, which in an emergency would also be a big help. I can’t imagine traveling without this gear. I find it tragically ironic that James Kim was an editor at CNET, in other words, a journalist that dealt with the latest technology, yet he lacked the one piece of high tech gear that would have quickly saved them all, a PLB. Isn’t your life worth an investment of less than $500? My survival gear is there to keep me alive, even comfortable, while awaiting rescue from the 406 PLB’s digital distress signal. In bad weather, you may still be stuck for a day or two, you can’t always count on immediate rescue. See the Ultimate PLB FAQ on ETS for more about PLBs. Even a simple mapping GPS, a piece of modern gear easily useful in all sorts of situations, would have given him his position and allowed him to see how far it was to the town and possibly to the Black Rock Lodge. According to some published articles, he thought he was 4 miles from the nearest town when he was actually 15 miles away. He reportedly traveled about 8 miles in a circuitous route through difficult terrain before falling into the creek. Even more to the point, they were stranded just about a mile away from the Black Rock Lodge and even though closed, it would have provided better shelter and possibly food and other resources. If I might be so bold, in many cases something as simple and inexpensive as my Pocket Survival Pak thrown in the glove box might save the day. It’s at least a good start on being prepared for the unexpected. Back to preparations; if you are traveling in cold weather areas, even if your plans are to stick to the major highways, a snow storm could still strand you. 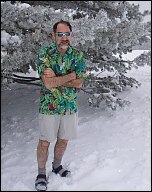 Wear or carry clothing appropriate to your route of travel, you don’t want to be stranded in cold weather wearing a hawaiian shirt, shorts and sandals. An independent and safe means to heat your shelter, in most cases your vehicle, is a great survival aid. The simplest is a long lasting multi-wick candle, which you can purchase (the NUWICK 44-hour and 120-hour candles being perhaps the best of the commercial products) or assemble a coffee can survival heater (instructions here, courtesy of NOAA). A single candle, useful to heat a snow cave or similar small volume, will not do a very good job of heating the large volume of a typical vehicle, particularly if there’s only one person. Make sure you have proper ventilation if you’re using any fire producing gear to heat your shelter. So, proper preparation might well have prevented this tragedy because, at worst, they would have been better prepared to be stranded and perhaps Kim may not have felt the urgency to try and walk out to get help, and at best, had they a PLB, it would have likely never even made the news. Communication is safety. In aviation, we have flight plans. Whether we file one with the FAA or just do it informally with a responsible party, we let someone know where we are going, how we are getting there and when we are due to arrive. If we don’t close that flight plan, letting them know we arrived safely, then the appropriate authorities will be contacted and a search will ensue. In a matter of hours help will be on the way and they will have some idea of where to search, provided we haven’t strayed too far from our planned course. No matter if you are driving or hiking or boating, the same principle applies. Four-wheel drive, such as Kim’s vehicle had, is handy and a definite safety advantage in bad weather. However, it can lull you into a false sense of security and when you get stuck with four-wheel drive, you are really and truly stuck. If the weather is bad and you can’t see where you are going and you are not familiar with the area, then STOP! Unless you are on a off-road adventure with proper gear and equipment, if the road is getting bad, then STOP! Stop before you have no other choice by getting stuck. Resist the urge to get to your objective at all costs. Get-there-itus has been the downfall of many travelers. Has they stopped earlier, they may likely not have found their lives in peril. Patience may not only be a virtue, it may be a lifesaver. I should also note that many short cuts have led to disaster. A short cut may well be the longest trip you ever take. Staying put is one of the cardinal rules of survival. Unless you have no hope of rescue because nobody will miss you, you should never leave where you find yourself lost or stranded unless you are certain as to where you are going and that you can make it there. I like to say that if you cannot see it, don’t even try. The longer you are stranded, the higher the pressure is to “do something.” In this case, as with many, the results are tragic. As is so often the case, those left are eventually found and survive, the one who left for help dies. Certainly, after a week the pressure on Kim to go for help must have been very strong, but the unfortunate results speak for themselves. You can find out more than you likely ever wanted to know about what happened to the Kims, the investigations and the still unresolved questions on Charles Wilson’s KimTragedy.info web site. Lessons Learned from the Kim Family was written on December 8, 2006 and filed in Gear, Musings, News, Survival Related Musings.